Read this if you are a reptile phobe... while walking about… - Ramblings of Mad Shutterbug & the Border Collie Bros.
Read this if you are a reptile phobe... while walking about the south 4 of the home compound of our Ranch today (heading back to the House for fluids & a short break on the fencing) Herself spotted this shedding, from an indigo. 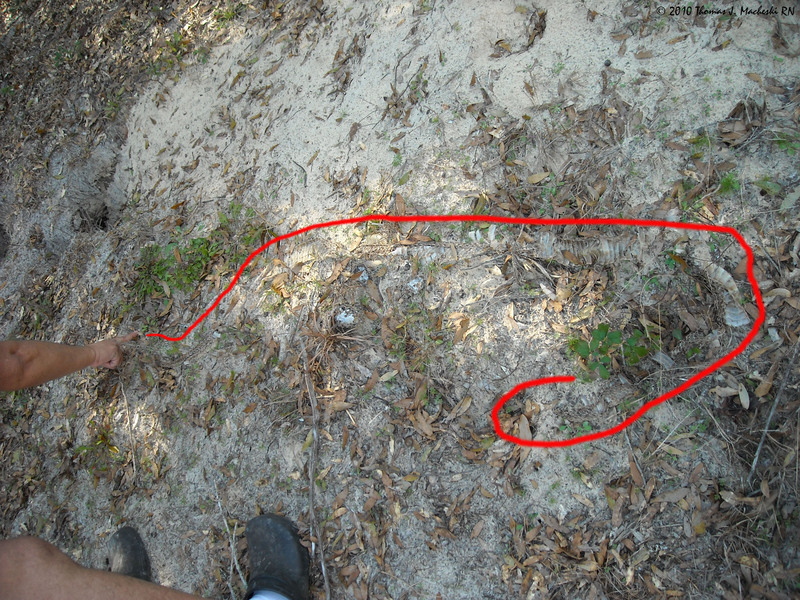 Actually, we'd spotted a live indigo as well, who once zie realised we'd spotted them departed down a gopher tortoise hole which was right handy nearby. That one, however, did not leave this shedding as it is only about a metre long and not quite 3 cm diameter yet, a youngster. I've lined alongside the shedding in the photo to help you trace it. Click the photo itself if you've a mind to, takes you to Flickr. But this is the large size here and probably easier to see it. In other news, we've finished stringing the barbed wire along the top of the fence dividing Cow Pasture from Home Compound. This will perhaps dissuade bovines from wandering over to this side and disrupting Herself's garden. On the other hand, if it does not, there will be more beef in the freezer.